"It is not so important to be serious as it is to be serious about the important things. The monkey wears an expression of seriousness which would do credit to any college student, but the monkey is serious because he itches." 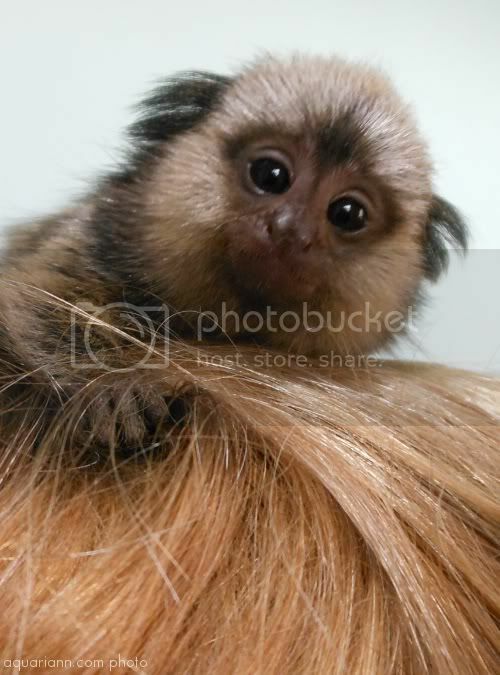 Isn't this baby marmoset monkey the cutest pet you've ever seen?! A week after getting to meet him at work, I'm still swinging from the branches in excitement. His owner named him Munchi, after the Monchhichi monkey dolls. He's only 8 week's old, and yes, he's perched on top of my friend's head. He took a nap there only moments after the photo was taken. Aww, this is such a sweet photo! Adorable! I love those little marmosets! Nice capture, is he/ she yours? He/she is too cute! Great capture. Isn't that cute! Thanks for sharing. Munchi is a cutie! What a great experience it must have been to meet him! I need to be careful...lest I be overcome by the cuteness! Adorable! This is a really beautiful pic. It's also a really beautiful blog - my first time here and I'm very glad I found it. What a cute little critter. What a sweet little face. I thought all that hair was a tail at first! Thats a great image lol !! A monkey nap on my head?? I don't know . . . . ??!! Love the monkey, cutest face ever! Oh my how adorable! I agree with autena that I'm not sure that I'd want him napping on my head, though. That little monkey is SO cute! Adorable. As long as he stays that size. I bet your friend didn't think the day would include a monkey on her head. So cute and sweet! Nice capture! Love this monkey! It is so cute! What a cute monkey! :) Thanks for sharing!